There is no feeling as gratifying for a doctor as the moment when he or she sees the patient feeling renewed, energized and happy after their treatment. That’s exactly how Dr. Tehrany felt when Dorothy Best visited Manhattan Orthopedic Care 8 months after her knee arthroscopy. We first met Dorothy when she came with an unbearable pain in her left knee. The pain had been troubling her for the past 2 years and she needed the help of an orthopedic specialist badly. We were immediately charmed by her positive spirit, which was an additional motivation for our team of orthopedic physicians to help her get back to her normal day-to-day activities as soon as possible. After a thorough exam and MRI review performed by our leading orthopedic knee specialist Dr. Armin Tehrany, Dorothy was diagnosed with a meniscus tear in her left knee. Unfortunately, the knee injury was a little bit more complicated than Dorothy expected. The MRI revealed a complex tear of the medial meniscus with a suspected folded fragment near the posterior horn root attachment and extrusion of the body segment. Due to the complexity of the meniscus tear, the only solution was an arthroscopic knee meniscectomy – a minimally invasive procedure aimed to remove the damaged portion of the meniscus. 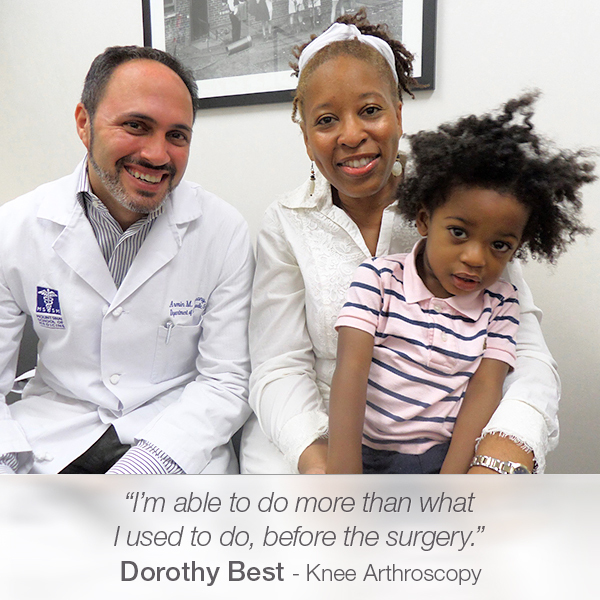 The meniscus repair surgery for Dorothy was followed by a recovery process that went smoothly and easily. 8 months after arthroscopic knee surgery on both her knees, Dorothy is feeling perfectly fit and able to do more than she used to do, before the knee arthroscopy. She feels comfortable while running, which is her favorite sport. “Last year, I couldn’t run at all, but- after surgery? I’m on the run!” Dorothy said with a big smile on her face. “I’m so glad! Ok, good. I want you to continue doing the running, at a comfortable pace. Running is not great on the knees if you are doing marathons, but for you to run at a slow pace, I think you’ll do fantastic.” Dr. Tehrany happily replied.